“No identification is required to vote in New York City and State. Any voter can show up on election day to the correct polling place and cast their vote, with their signature used to verify their identify. Any voter has right to vote wearing whatever clothing they wish as their signature is their sole verification of identity. New Yorkers have until Friday to register for what may be the most important election in our lifetime. Roosevelt Island, New York – Beginning October 11th at 10:00a.m., IDNYC, the Mayor’s Office of Immigrant Affairs (MOIA), Council Member Ben Kallos, Congresswoman Carolyn Maloney, Manhattan Borough President Gale A. 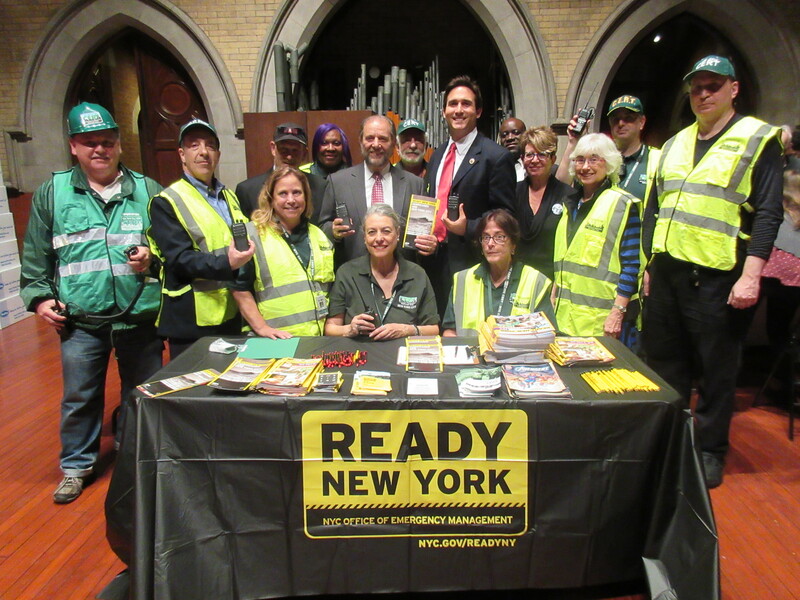 Brewer, Senator Jose M. Serrano, Assembly Member Rebecca Seawright and the Roosevelt Island Operating Corporation are co-sponsoring a new IDNYC Pop-Up Enrollment Center. Located at the Roosevelt Island Senior Center – a program of the Carter Burden Center for the Aging at 546 Main Street, the center will run from October 11th until October 17th with operating hours of Monday from 9:00a.m. – 12:00p.m., and Tuesday through Friday from 9:00a.m. to 5:00p.m. Council Member Kallos will enroll for his own IDNYC card immediately following the press event. New York, NY - Today the Metropolitan Transportation Authority and New York City Transit were petitioned by over 2,700 Upper Eastside residents and the five elected officials that represent this area at every level of government to restore the M15 Select Bus Service stop at 72nd Street ahead of the completion of the Second Avenue Subway. When Select Bus Service was introduced to First and Second Avenues on the M15 route these stops replaced Limited Service stops in every location above Houston Street other East 72nd Street. Residents who live near 72nd Street must choose between walking as much as half a mile to Select Bus Service at 67th or 79th Streets, too far for one-third of households in the immediate neighborhood with children or seniors. Please restore the M15 Select Bus Service at 72nd Street. The M15 Limited stopped at 72nd Street until it was phased out in favor of M15 Select Bus Service. With high bus-dependent populations, infrequent local service, crosstown bus service, hospitals, community support and opening of the Second Avenue Subway with a station at 72nd Street, now is the perfect opportunity to increase ridership by restoring M15 Select Bus Service at 72nd Street. When Select Bus Service was introduced to First and Second Avenues on the M15 route, Select Bus Stations replaced Limited Service stops in every location above Houston Street other than East 72nd Street. Since October 2010, residents living in the East 72nd Street area, for example at 73rd off York Avenue, now must choose between walking three avenues and six blocks, more than half a mile, to a Select Bus Service bus station at 67th or 79th Streets and Second Avenue, versus half that distance to 72nd Street. Walking more than half a mile in both directions is simply too far for many residents. Dear Chairman Prendergast and Commissioner Trottenberg, Thank you to New York City Transit and Department of Transportation for addressing the previous letters concerning service quality on crosstown buses by implementing Select Bus Service for the M86. I now request that you expand crosstown Select Bus Service to improve service on the M66, M79, and M96. Each year, the New York Public Interest Research Group’s Straphangers Campaign evaluates bus service, and grants the “Pokey Award” to the slowest bus line in the City, an honor received on a regular basis by crosstown buses serving my district: the M66 in 2012 at 3.9 MPH and again in 2015 at 3.1 MPH, the M79 in 2014 at 3.2 MPH and the M96 in 2008 at 3.7 MPH. New York City Transit and the Department of Transportation can bring improvements to both bus lines by implementing Select Bus Service that provides off board payments to reduce dwell times in order to move buses faster. "NYCHA should not move forward with this plan until they have gained the support of local residents, assured they will have preference for new units being built, and committed to building 100% affordable housing," said Council Member Ben Kallos. "I am proud to celebrate this playground with the residents of Holmes Towers and hope that their voices will be heard as this process moves forward." "There is no place for bigotry and hatred toward Muslims or any other religious group or race in New York City," said Council Member Ben Kallos, Progressive Caucus Vice-Chair. "We must do everything in our power to fight racism wherever we see it in our City. New York City's reputation as this country's largest melting pot must go on without instances of discrimination and hate."